Cheap plastic faux-awning, inferior digital typeface, unnatural spacing between words... in other words, another cheap facsimile of what was there before. And the removal of the word "restaurant" is telling. What the hell, is it made of latex? And the uglification of Avenue A continues. Yes, it's telling, telling the truth. Doc Holliday's didn't serve food. "Yes, it's telling, telling the truth. Doc Holliday's didn't serve food." I think they did...some 20/30 years ago. I may just be getting too senile, but for some reason I seem to remember having had burgers and fries in there. 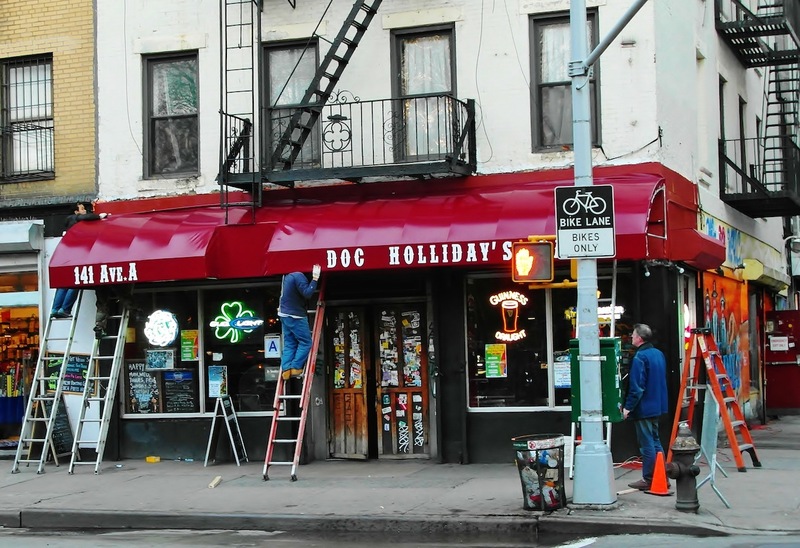 The last time I was at Doc's I was 86ed for complaining about bartenders pouring unfinished drinks out when I went to the bathroom to make more tips and sell more drinks. At one time the bar did sell food a long time ago. What I meant was, it is telling in the sense that bars and restaurants don't co-exist like they once did, except in the form of gastropubs and resurrected speakeasies. 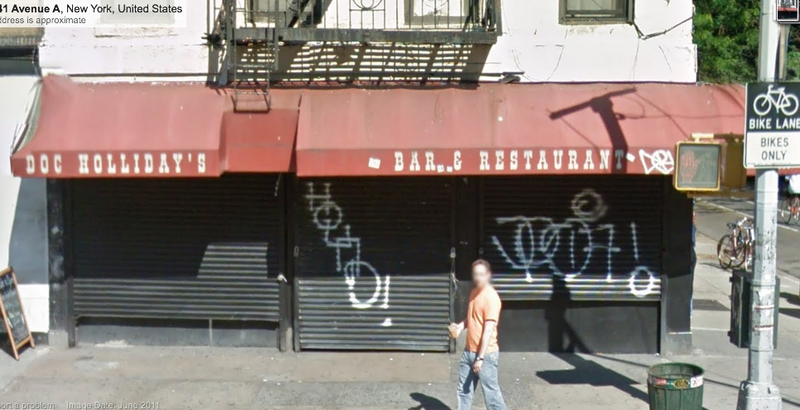 I was merely noting it's another element of the city that's fading away. Nowadays, you have all these bars or nightclubs pretending to be a restaurant, or a bakery, so that they can get a full liquor license. Now that's telling, telling the truth. 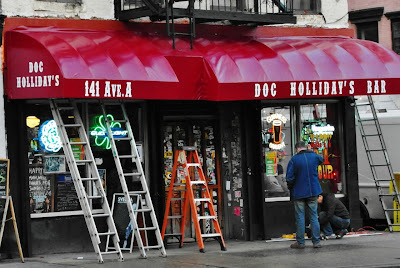 Doc!s served food from 1994 until they realized it was a futile endeavor. 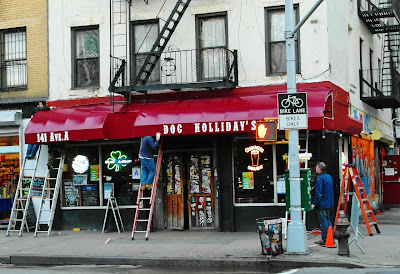 That was the original awning, having lasted over 19 years, was a great run, but the address was not prominently displayed for those not familiar with the place. It was also further damaged by the hurricane...what weather and outside elements had done to the place over the years was unavoidable. 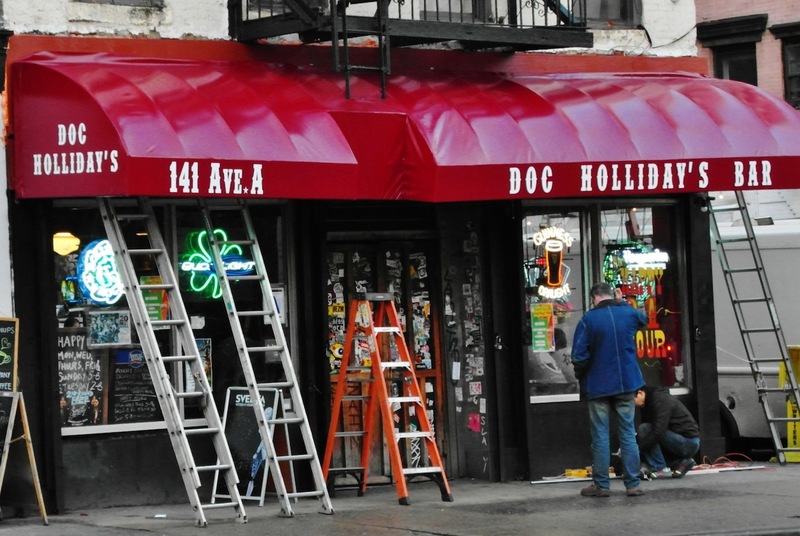 Actually what is telling is that the original awning maker is no where to be found...nor will local bars like Doc's if landlords keep jacking the rents and making deals with corporations like 7~11 or similar. The material might look inferior because prices are insane and bar owners go with what seems most reasonably priced, while getting the job done. Fabric might look better, but try cleaning it! Also, it looks really red and plastic like in those photos, but its really a burgundy color, I don't know why it looks so red and shiny in that photo. Much better in person.